One of living room essentials that will its design is sofa. However, you need to consider what sofa style that will be fit to your living room. Think about the style, color, and size. No matter the sofa that you choose, it has to be looked aesthetic and appealing. Here, you may see a dreamy living room in a house that located near lake. This is awesome with L-shaped sofa for formal and open concept living room. The carpet and the walls also work well to show a friendly room design. If you live in an apartment with small space, installing L-shaped sofa need more effort. However, grey sofa will give casual look. Add with brighter pillows to live it up. Then, apply more natural lighting for best living room appearance. This living room design is great for condominium or apartment. With deep gray color sofa, you will gain modern glam living room look. Furthermore, you have plenty natural light form the glass window. You may apply this casual vibe living room with loose back cushion in grey. Two bright color pillows dramatically attract people eyes. Large window allows this room to get more natural light for better health. If you love rustic style for living room, this design will look interesting. 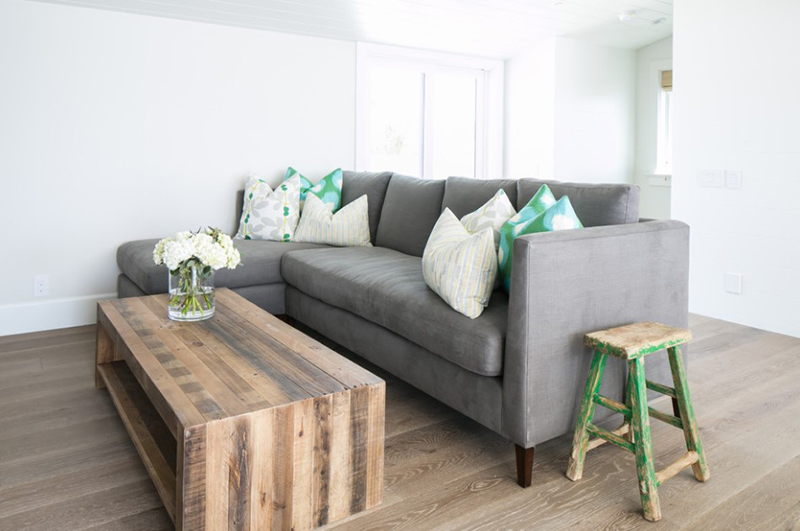 With wooden floor, wooden table, and reclaimed wood coffee table, this living room tells you more about rustic vibe. Then, L-shaped grey sofa completes the classic tone. A living room with neutral color may easy to decorate. See this living room with wooden floor, white walls, and black rug show you harmony design. It looks minimalist and inviting for modern house style. The combination of L-shaped sofa and fire place create a sophisticated living room design. You will have better time to get warm conversation with your family. White wall and wooden floor looked as a great pair as well. The application of L-shaped sofa can create high ceiling look. Moreover, the glass wall adds more light that makes this room brighter.